which first made its debut, in December of 1892. It was a celebration of my sweet Bebe's 7th birthday. 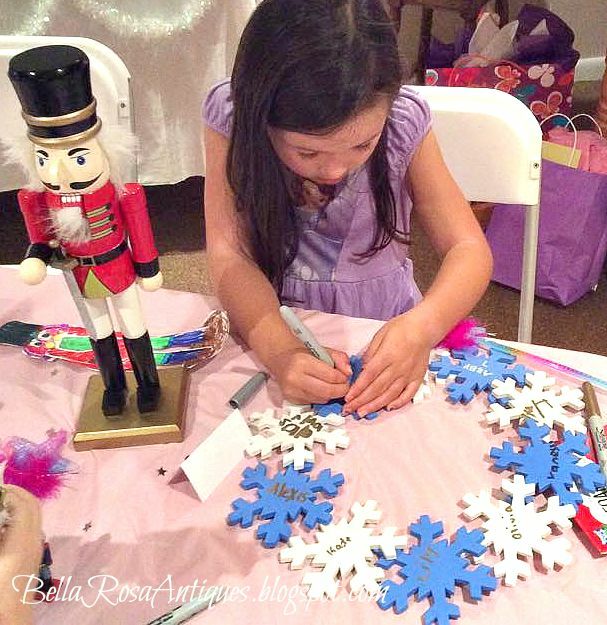 Her wish this year was to have a "Nutcracker Party." I was just as excited to plan it. 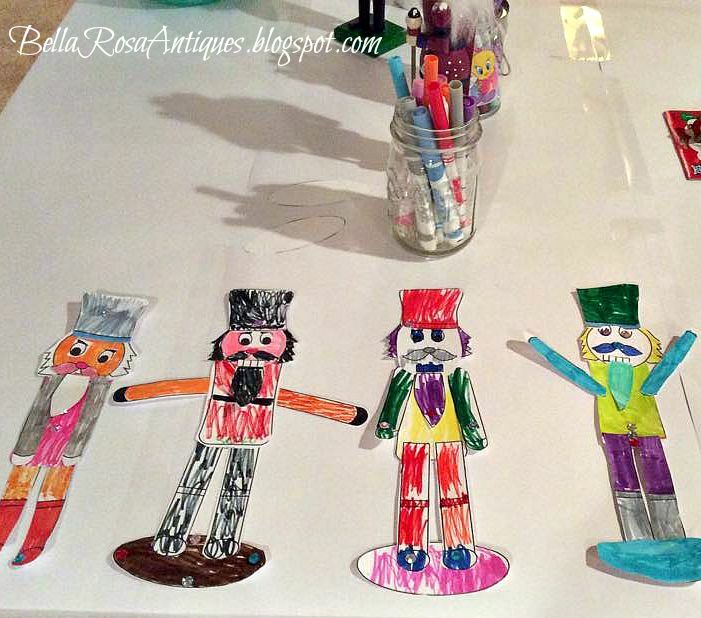 The Nutcracker is a two-act ballet, originally choreographed by Marius Petipa and Lev Ivanov with a score by Pyotr Ilyich Tchaikovsky (op. 71). The libretto is adapted from E.T.A. Hoffmann's story The Nutcracker and the Mouse King. It was given its première at the Mariinsky Theatre in St. Petersburg on Sunday, December 18, 1892. Although the original production was not a success, the 20-minute suite that Tchaikovsky extracted from the ballet was. However, the complete Nutcracker has enjoyed enormous popularity since the late 1960s and is now performed by countless ballet companies, primarily during the Christmas season, especially in the U.S. Major American ballet companies generate around 40 percent of their annual ticket revenues from performances of The Nutcracker. Hang onto your sleigh.... here we go! for eye appeal as soon as you walked in. 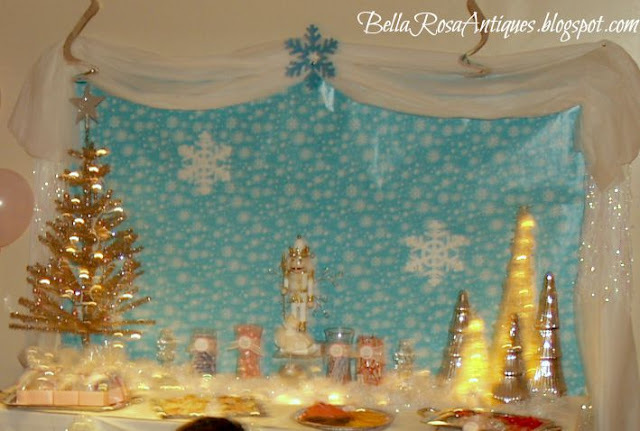 A sparkling tree graced the table, a purchase that I made several years ago from Katie's Rose Designs. White lights covered by snowy garland gave a wintery effect. 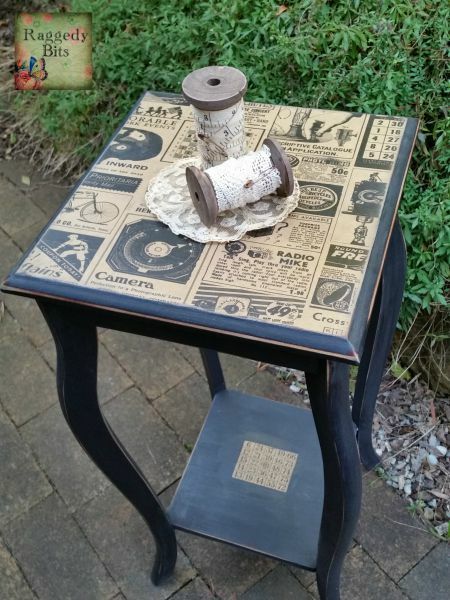 I've been collecting silver plated trays for a while now and they came in handy for this table. One is holding "thank you" goodies that I gave to each girl as she left. press we found at a sale a couple of years ago. 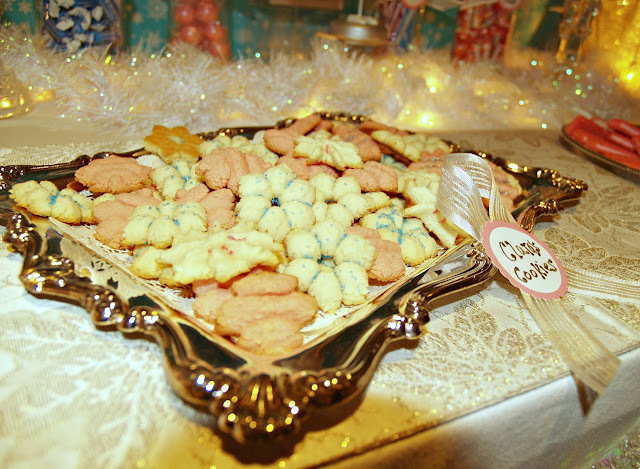 I named them "Clara's Cookies"
with a pink label and white ribbon. 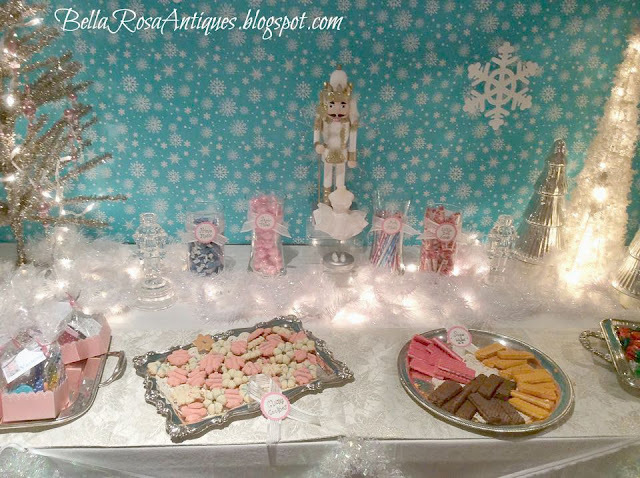 "Little Doll Sweets" and "Fritz Sticks"
Clara turns into a princess. beads at our local Goodwill. I was in disbelief that it was there! So of course I bought it! It was the perfect touch. 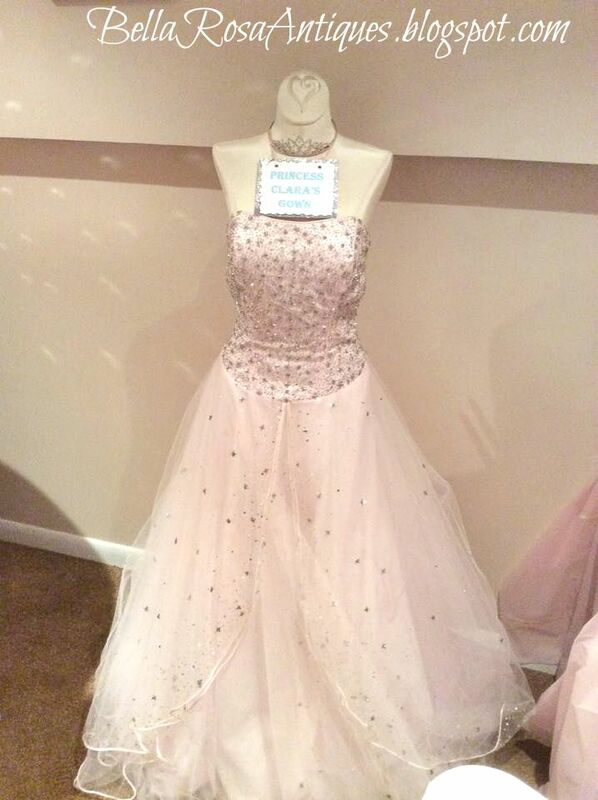 I labeled it "Princess Clara's Gown." The big snowflakes in the background were found at the thrift shop up near our lake house. I've been collecting things to use for a few months now. 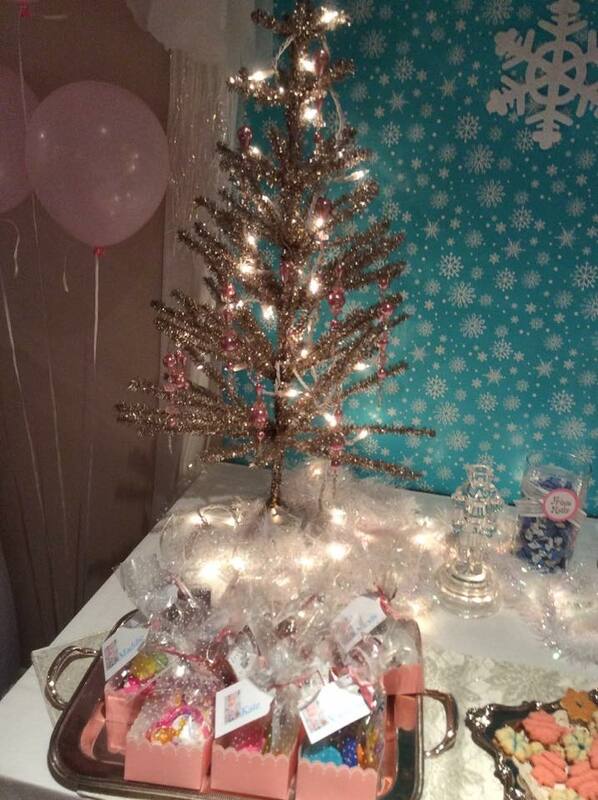 I had so much fun planning and setting up the party. and performed the dance from the show. impressed and her talent was amazing! right now but it was true! 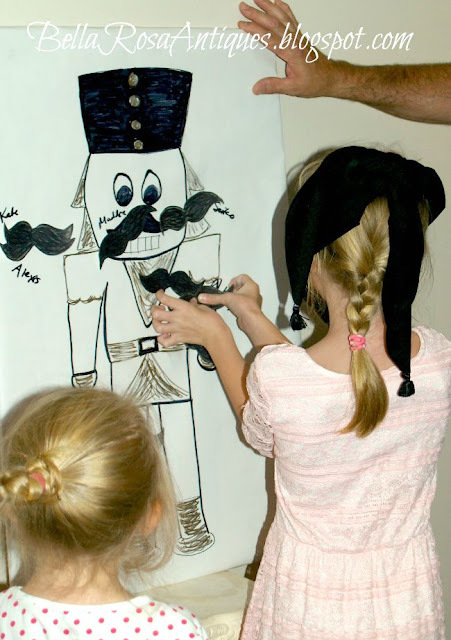 We played "Pin the moustache on the Nutcracker." My drawing wasn't too bad! I printed the "moustaches"
on my computer using Word clip art. free printable I found online. in the land of sweets! can't believe how fast the years go! 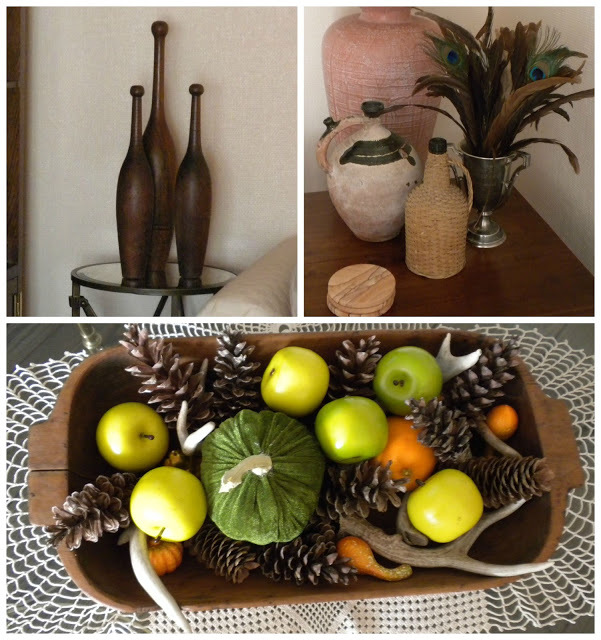 for me to get out my autumn décor! changed the look of it! and some "local history on a plate!" 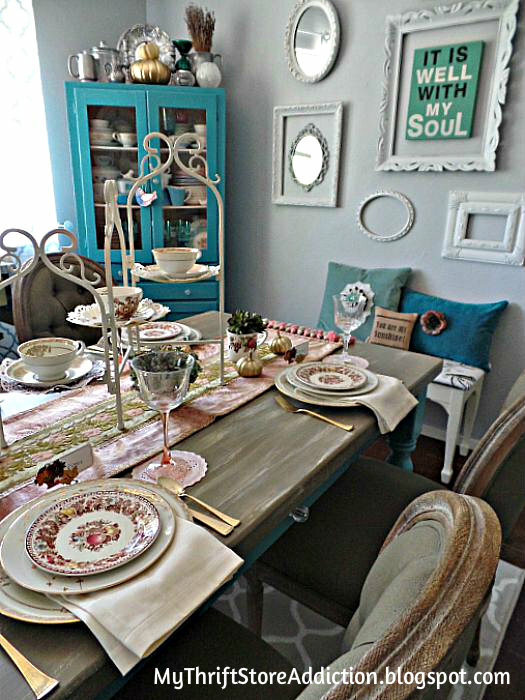 shared her rosy Fall tablescape. Jillian, oh my, two surprises for me today! 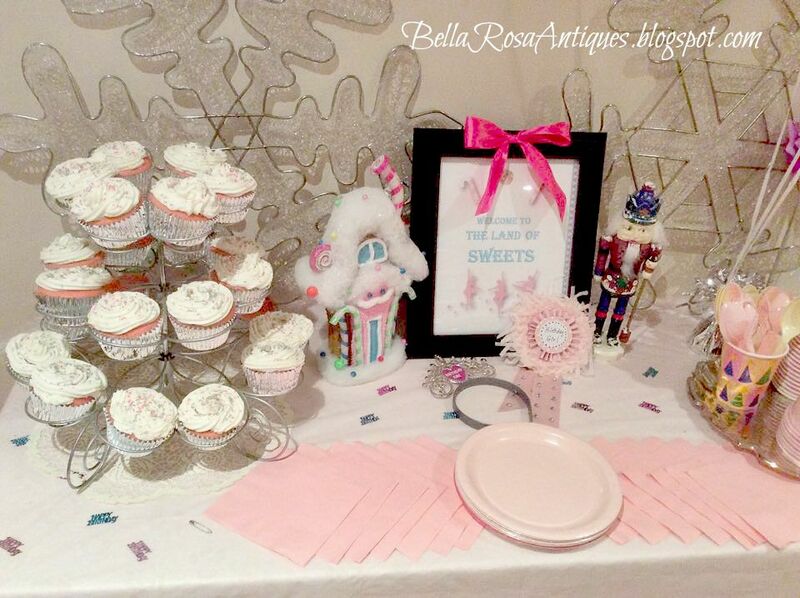 Thank you for the feature of my fall decor, and your bebe's party! You & I both have a history and love of ballet, and this was just fantastic - your decor, the activities, and even your husband dressed as the Nutcracker. So, so sweet. My oldest daughter has danced several of lead roles in Nutcracker, including Clara & Sugar Plum Fairy, so this was a particularly sweet stroll down memory lane for me. Thank you for the party. 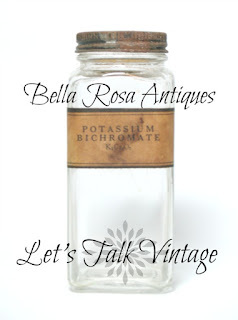 An absolutely stunning post!! LOVE the Tree!! 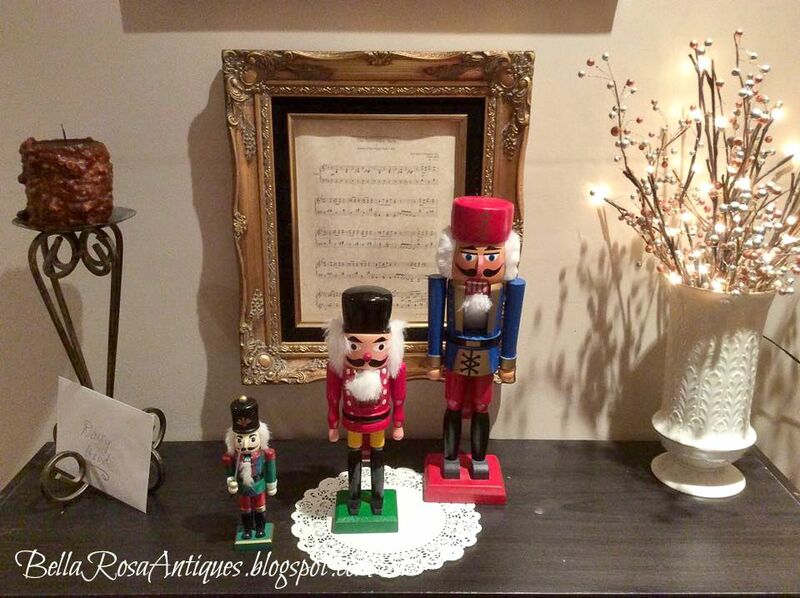 Jillian thanks for hosting and I love those little nutcrackers.They are adorable. 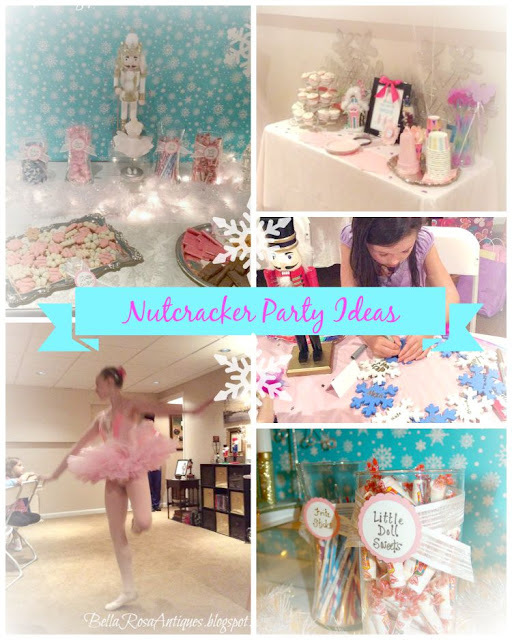 What a wonderful 7th Nutcracker themed Birthday Party. Thank you Jillian for Lets Talk Vintage 49. 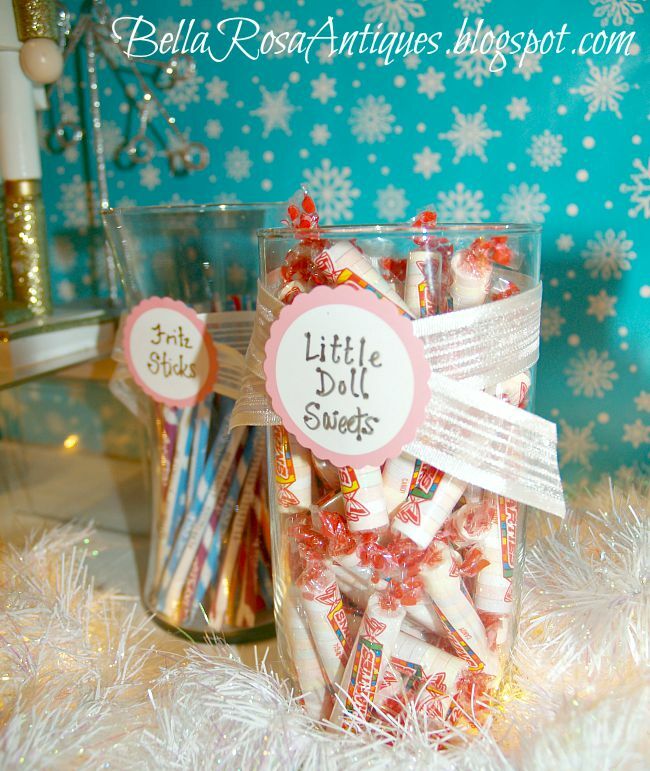 What an adorable idea for a birthday party---who said it must snow...in order to enjoy the Nutcracker---I'm sure you had the music in the background all the time. Love this ---since my going to be 3year old granddaughter wants 'Avengers' for her birthday, LOL. 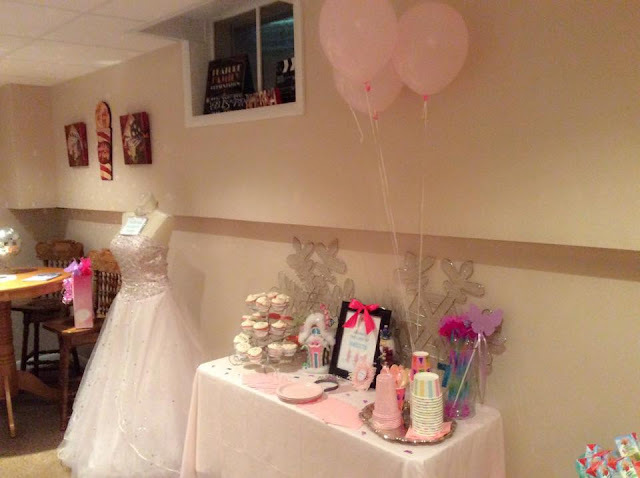 Holy moly Jillian, you did such a fantastic job with your girlies party! 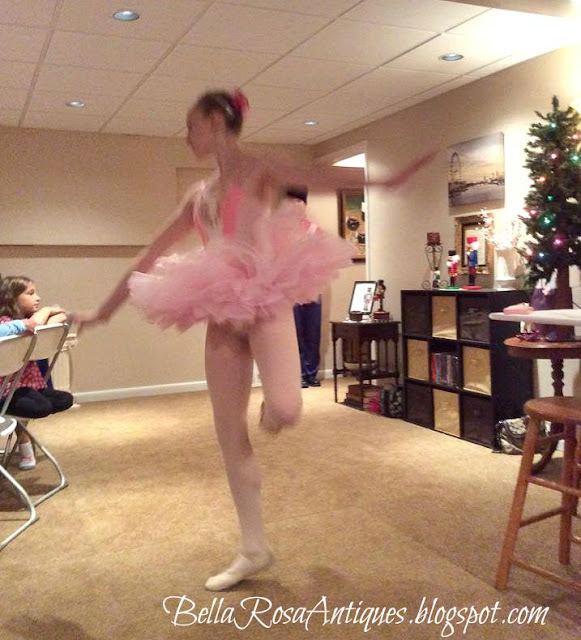 She must have been in complete Nutcracker heaven. And how darling that your hubby dressed up:) Everything looked amazing, thank you for sharing with us! What an amazing party! Your daughter is blessed to have such a creative Mom as you! Great ideas! WOW What a GORGEOUS party! So perfect in every way and what a delightful time your sweet daughter must have had on her special day! Just beautiful!!! Thank you for sharing such a precious day! Jillian, the party must have been a wonderful success! I love the way you decorated. What a wonderful memory for your dear Bebe. Thank you for hosting and sharing all the beautiful photos. What a fun party theme, you did such an awesome job with all the food and decorations. Thanks so much for sharing the party at VIParty. Hi! 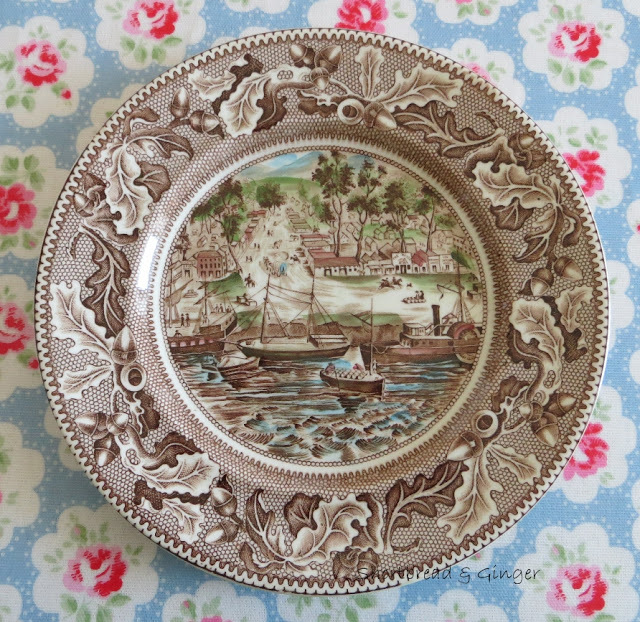 Delighted to see my lovely plates featured on Let's Talk Vintage. Many thanks.